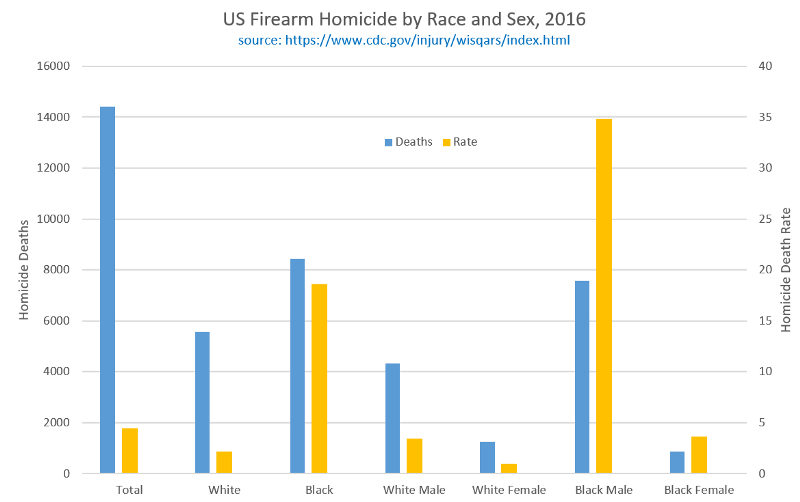 In my first story on Medium, we discuss some of the ways in which left of center media sources warp statistics to support the “we have a gun problem” and the “more guns = more homicide” narratives, largely by conflating suicide and homicide into one all-encompassing number, while not making that conflation clear. 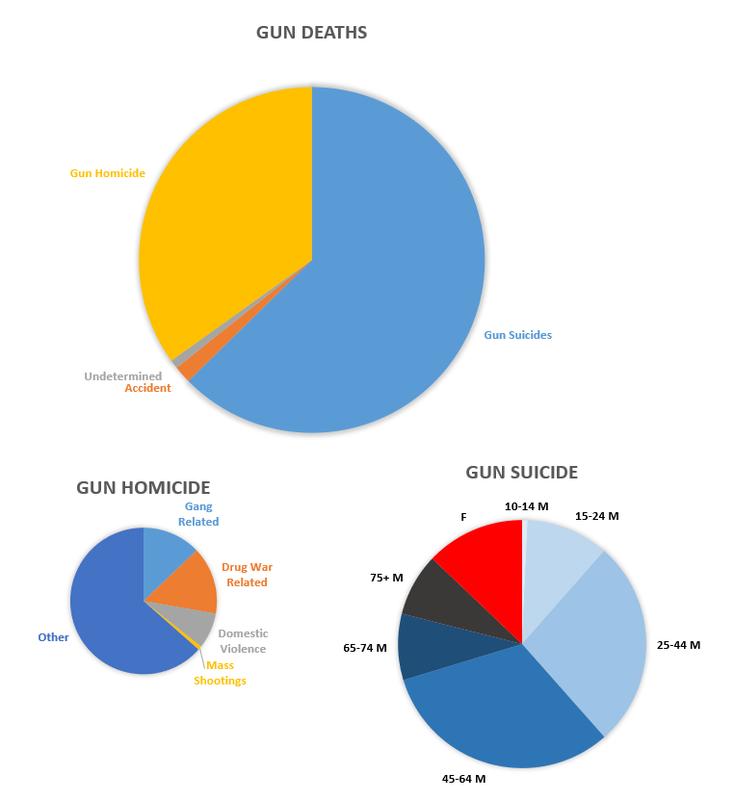 In the second story, we deliberate on the constituent elements of this “gun deaths” number, which is actually dominated by male suicides, and we discuss easily implementable ameliorations to that very real problem. Go read those articles first if you have the time. Here, we’re going to peel apart the gun homicide numbers as best as we can, to examine those. Before we get into looking at this graph, I want to point out something. I set the Y intercept at zero, even though I only have data points down to around 4 homicides per 100,000. It wastes white space on the graph, but showing the origin prevents you from being misled about the data. That trick — moving the origin around to confuse the reader about the data — is tremendously popular with modern media outlets, particularly cable news. Fox News gets rightfully trashed for this routinely, but CNN and other sources do it too. Watch closely for it, and when you see it, be especially critical of any commentary that accompanies the doctored graph. People who doctor graphs are usually trying to sell you something. We have a slow climb of homicide up until 1920, when there’s a major spike and a high plateau right round the prohibition of alcohol. Prohibition lasted from 1920 to 1933, where government created a tremendous black market run by organized crime, and homicide rate stays above 8. The rate plummets precipitously after 1933. It’s stark, and obvious. We have a window around the 1950s and early 1960s of sub 4.5 rates, and then rates skyrocket again, this time with the ramp up of illicit drug use, and the associated prohibition wars thereof. They peak in 1980, they peak again in 1990, then fall precipitously in the 2000s. We get a small spike around 2006, and then they fall off. A bit of honesty: I’m implying here that the homicide rates track with drug and alcohol prohibition without supporting the implication. I may try and support that implication with a future article, but there are other possible explanations, such as immigration, economics, or even lead in the water. The lead thing is actually pretty intriguing, although I remain skeptical for now. Tackling the vast array of multivariate homicide drivers is out of scope for this article. But look closely. Our current homicide rate is historically low. I’ll say that again, to be extremely clear. 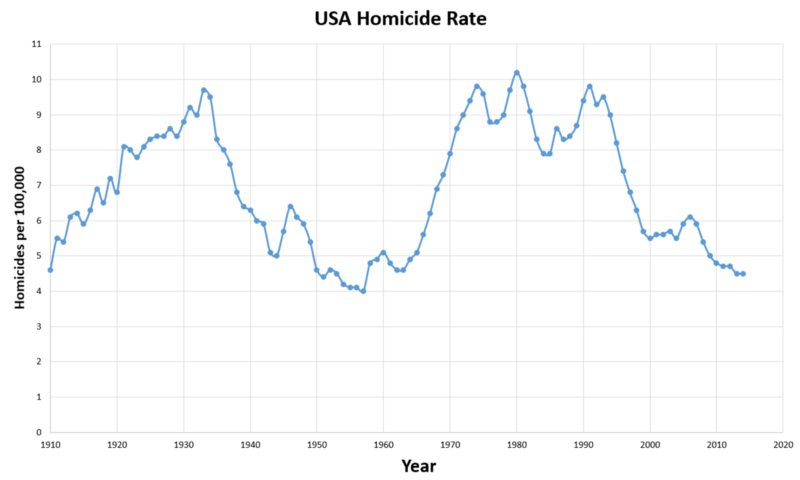 Our current homicide rate is historically low. The lowest in my lifetime, and odds are it’s the lowest in yours. We are in the dead middle of a stretch of low homicide that’s only been experienced one other time in the last century in this country. If you are Generation X or younger, you have never been this safe from homicide in your entire life. The last time the homicide rate was this low was before the Beatles released “A Hard Day’s Night.” That’s an impressive achievement. But it’s characterized across the media, both left wing and right wing, as “an epidemic.” We might argue about how we’d like to define the word “epidemic,” but it is very clear that Merriam-Webster would flatly disagree with the characterization. What even is an epidemic? It’s a rapid spread of infectious disease inside a short span, several weeks typically. What sort of rates constitute an epidemic? With meningitis, an epidemic would be 15 or more cases per 100,000 people within that two-week span. 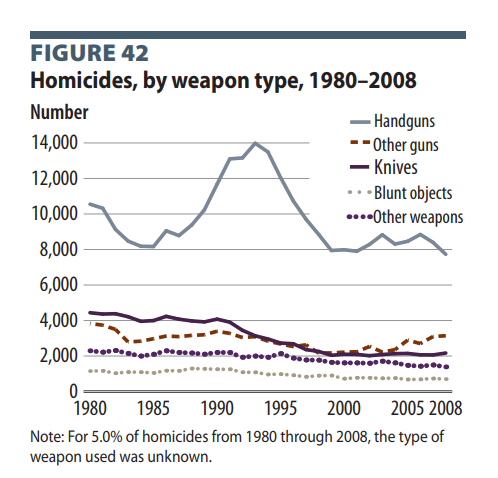 Our overall homicide rates are below 5 per 100,000 people per year, with gun-specific homicide even lower. But that’s not fair, because it depends on the disease, and what the baseline rate of disease cases is. It all goes back to baselines. Well okay, let’s visualize that. Follow that link. Read that study. Like almost everything the Pew Research Center does, it’s nonpartisan, and very good. Come back here when you’re done. What in the heck is going on here? Crime in general, and homicides in particular, kept going down and are now fluctuating around a low valley, but the public perception is the exact opposite of the truth. Why is the media making verifiably false claims about a homicide epidemic? It’s possible that they’re simply dumb, or careless, but I doubt it. It’s possible they’re doing it because epidemics scare people more than facts do, and scared people click more, which grows their revenues. Or it’s possible that falsely manufacturing a frenzy about an epidemic serves a different, more politically motivated purpose. I can’t be sure. What we really have, is not an epidemic of homicides, but an epidemic of news stories about homicides. Someone probably earned a few pennies from your click. This study’s objective was to explore national news media’s reporting of gun violence around a mass shooting. National news pieces were coded according to categories of gun violence, media frames, entities held responsible, responses, and reporting of the public heath approach. Individuals were held responsible for gun violence in 63% of pieces before and 32% after the shooting. Lawmakers were held responsible in 30% of pieces before and 66% after. Background checks were a proposed gun violence prevention method in 18% of pieces before and 55% after Sandy Hook, and lethality reduction of firearms was in 9% before and 57% after. Following a mass shooting, the media tended to hold government, not individuals, primarily responsible. The media often misrepresented the real picture of gun violence and key public health roles. It’s an interesting study, but it doesn’t give us what we want, which is a measure of saturation. It also admits up front to focusing on gun deaths from a public health approach, which is the now popular tack the left takes towards gun control and confiscation, which prompted the Dickey Amendment. The Dickey Amendment, for what it’s worth, does not prevent the CDC from doing gun research, it merely prevents it from using public money for political advocacy. Many people on both sides of that argument have strong opinions, and I won’t wade into them on either side. Nobody, to my knowledge, has tried to track the effects of social media on our public exposure to gun topics. In my observation it seems that the saturation of this topic is driven largely by social media sharing, Facebook and Twitter in particular, which gives people an impression of an epidemic when one clearly isn’t there. As people spend more and more time staring at their phones instead of the ‘real world,’ the virtual world they inhabit becomes reality to them, and this reality is absolutely saturated with guns and death. And Zuckerberg rakes in the revenue with every click. 3) All the fluctuations here are in the handgun number. 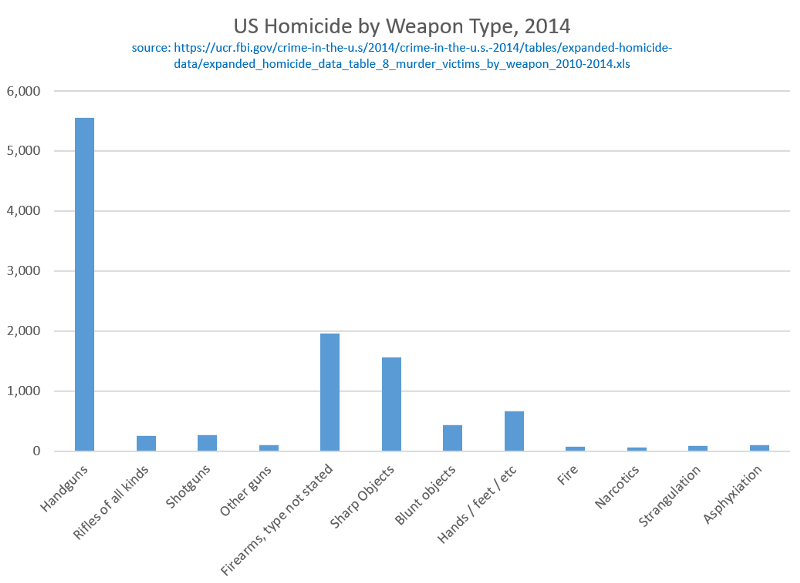 This graph should give you a firm understanding that the choice of weapon for premeditated criminal activity is not an AR-15, or a shotgun, or a kitchen knife, or a baseball bat. It’s a handgun, because a handgun is concealable. Handguns are where it’s at, if you’re going to commit a crime. Particularly a drug or gang crime. (the early ’90s spike coincides with the rise of crack cocaine) Wielding an AR-15 when trying to mug someone is a tremendous disadvantage, because everyone can see it coming. In 2014, homicides by any kind of rifle were only 3% of firearm homicides. They were 2.1% of total homicides, and 0.7% of total gun deaths. And that figure includes every kind of rifle available, not only semi-automatics with detachable box magazines such as the AR-15, but also bolt-action hunting rifles, Ruger 10–22 plinkers, and the whole lot. Suicide, which is the dominant figure in the “gun deaths” problem, is covered in the prior article. Now focus on the smallest pie above, which is homicide, and let’s also expand that by demographic. Good gracious. Black male homicide deaths are 35 per 100,000? That small subclass of homicide is approaching epidemic-ish. What on earth is going on here? Every time I open Facebook or turn on the TV, the media bombards me with images of white suburban kids or Las Vegas country music concerts being bullet-hosed by mass shooters. Why are they not informing me of the actual victimization going on? Well, okay. It’s possible that they’re racists. It’s also possible (here we go again) that they’re simply dumb, or careless, but I doubt it. It’s possible they’re doing it because their target demographic, namely white people with disposable income, isn’t scared about crime against blacks, so they focus on things that scare them more to grow their advertising revenues. Or it’s possible that they’re falsely representing the problem for a more politically motivated purpose. (sigh) I can’t be sure. I have not been able to find a racial demographic breakdown of drug crime and gang crime anywhere, but looking at the data, it stands to reason that there is a noticeable overlap between the black male homicide victimization rate, and drug / gang homicide. Perhaps more on this later. So what sort of shape would a plan to reduce gun homicide take? First off, the magic gun evaporation fairy referenced in the second article is not on the table. Secondly, the plan needs to treat the actual problem, instead of the public’s clearly flawed perception of the problem. Third, it’s clear that a plan to fix this will not come from our predominant media sources, which are fundamentally failing to convey the true nature of the problem properly.